← "Watchmen" now a Saturday Morning cartoon! Yeah! The seaweed is always greener – on somebody else’s turf! 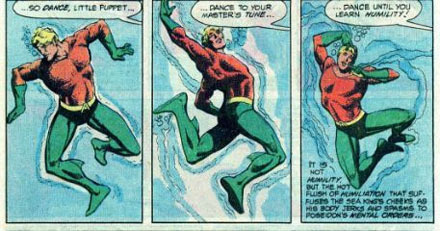 Geez, Aquaman’s only useful for comedy relief! He’s worse than those two disco kids and their baloony dog. After all that swimming around in the ocean, his costume has shrunk and is now too tight–hence the twitching.